Product #55506 | SKU AUSDX256GUII3CL10-C | 0.0 (no ratings yet) Thanks for your rating! Feature highest-level V90 video speed, supporting uninterrupted recording of Ultra HD 8K, 4K, and 3D/VR video by a range of devices. 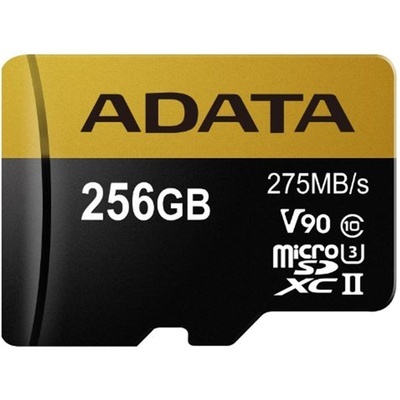 The ADATA 256GB Premier ONE V90 UHS II Micro SDXC Memory Card meets the latest UHS-II standards, providing ultra-fast read speeds up to 275MB per second, which is almost 3 times faster compared to UHS-I. Moreover, Premier ONE microSDXC UHS-II memory cards also feature highest-level V90 video speed, supporting uninterrupted recording of Ultra HD 8K, 4K, and 3D/VR video by smartphones, tablets, motion cameras, and drones. Available in 64GB to 256GB and backed by solid multi-point protection, Premier ONE microSDXC UHS-II Class 10 (U3) memory cards allow mobile device and outdoor activity enthusiasts to record and share wonderful memories with ease.